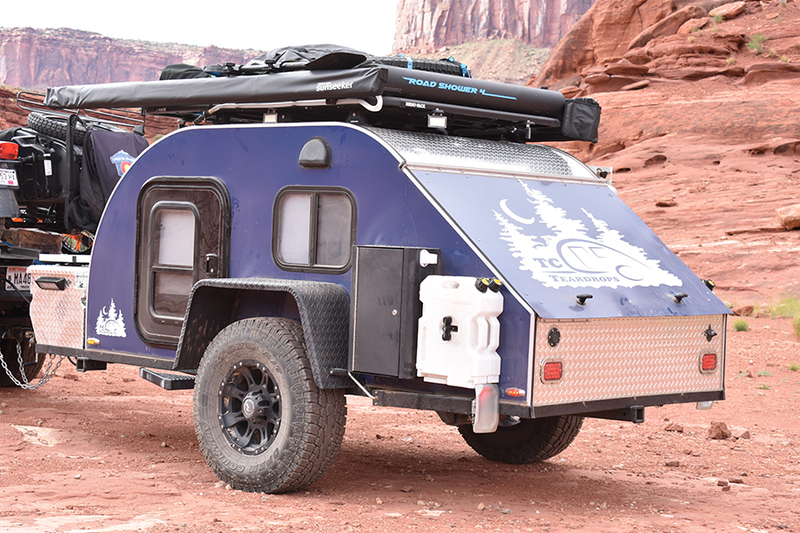 It’s obvious Todd is a very skilled individual, and being avid users of their own product explains why the functionality and design of their teardrop trailers seems so polished. 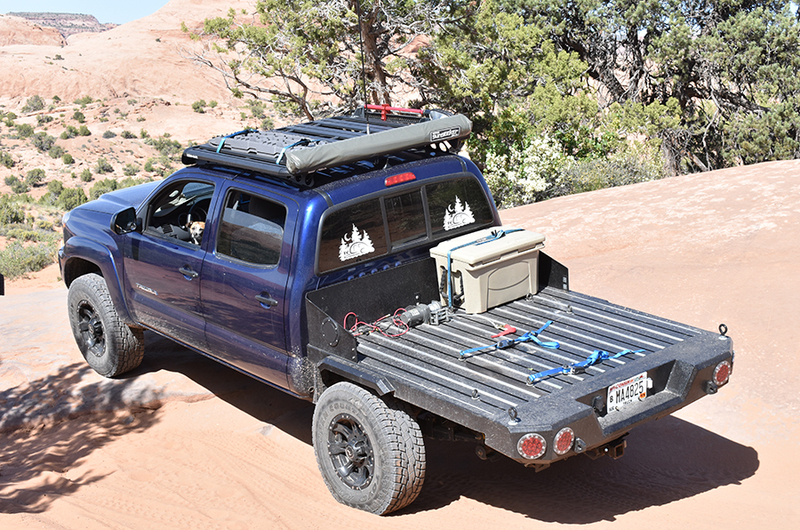 Our Off Road vehicle of choice is a 2014 Toyota Tacoma SB, and of course we matched it up with our 5×10 TCTeardrops Off-Road Expedition (ORE) trailer that goes everywhere we go. To make the Tacoma a little more capable of handling our overland adventures, we have added Bilstein 5100’s, OME Dakar HD leaf packs with Air Lift bags for stability, LT265/75/16 Toyo A/T’s, Raceline wheels, 4XInnovations’ 1/4″ skids on the engine and trans, Rhino Rack Platform to carry the Hi Lift Jack, Spare Tire, Traction Mats and anything else we thought we might need. 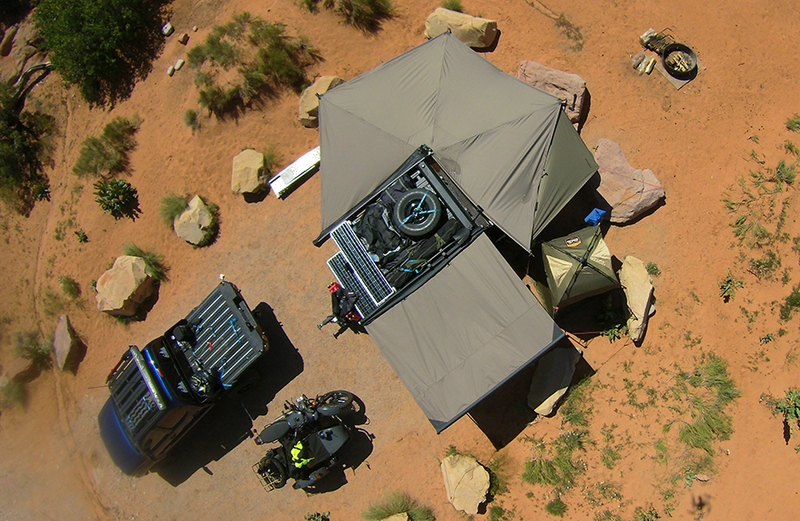 This is only part of our overland travel package; we typically bring either our mountain bikes or we haul the Ural Gear Up for even more adventures. That’s why we are running the Dakar HD leafs and airbags, as well as a custom-built flatbed that I designed myself and had ROAM Automotive in Munising, MI fabricate to go with my Magnum rear bumper. My RhinoRack Platform slats allow me to tie down gear anywhere on the bed. The Tacoma pulls the load great and we make yearly runs from Wisconsin to Arizona for Overland Expo, spending 4-5 weeks on the road every Spring. The Tacoma has 85,000 miles and has never had any issues. 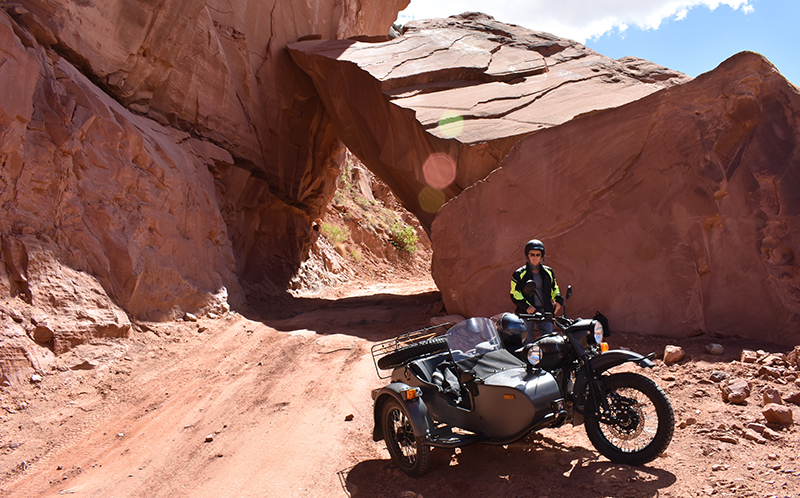 As for the Ural GU it’s a 2017 and it is as much fun as it looks, on and off road! 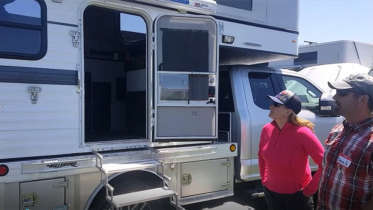 It hauls my wife Carol, our Jack Russell, Lexi and myself to remote destinations. Not only does it put smiles on our faces but also the faces of people passing by. The TCTeardrops 5×10 ORE is also setup to take into remote locations, and when we leave the house, every night is spent sleeping in the Teardrop – no hotels for us! 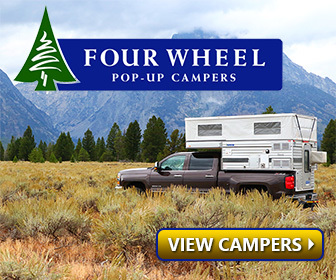 We carry a Dometic Porta Potti, on-demand hot water heater, 19 gallons of fresh water between the Rotopax and Road Shower, 180 watts of Zamp Solar paired up with a 100ah AGM battery and Dometic CFX-65DZ fridge, #3500 derated torsion axle with 10″ electric brakes, Lock N Roll articulating hitch, and Rhino Rack platform with both the Batwing and Sunseeker Awnings to give us plenty of shade in the hot desert. 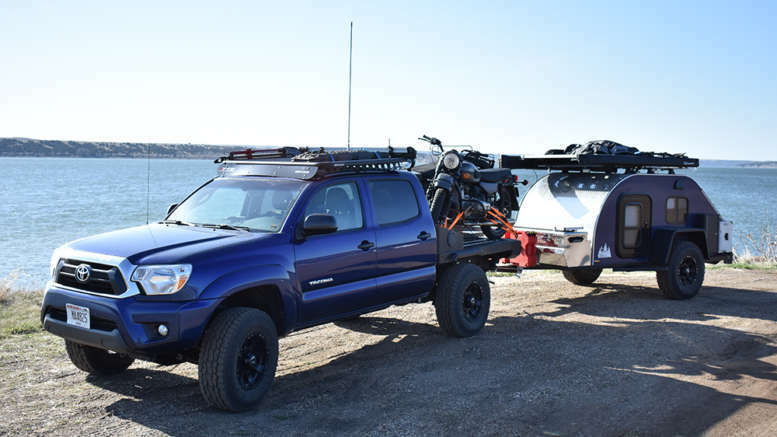 2 Comments on "TCTeardrops Owners Share Their Off-Road Expedition Trailer, Toyota Tacoma, Gear UP Trail Bike Combo"
Nice set up. Can you tell me if the batwing can be made relatively bug proof or are there too many gaps between the walls? The batwing here is an awning, not a sealed room so it would be open to bugs.